Unit studies are a good way to break up our homeschool routine. Homeschool Legacy offers a wide variety of unit studies that require very little effort from the homeschool mom. 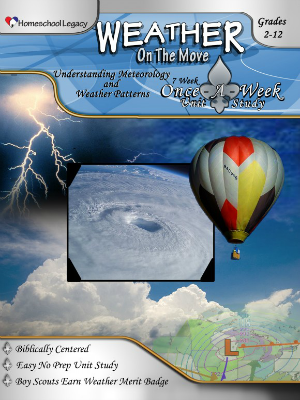 We received Weather On The Move digital edition to review. I downloaded mine to iBooks on my iPad & printed out worksheets. This made it very easy when we made our trip to the library. I just took my iPad so I could see the entire list. The Once-a-Week studies are set up to be used along with your regular school work. The main part of the unit study will be completed only one day a week. The other days of the week you will complete your core curriculum and the unit study reading assignments and the family read-aloud. 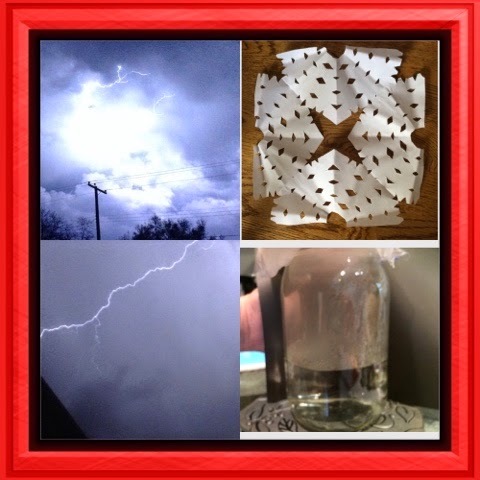 Pictures of lightning taken by Delaney, snowflake made by Alaina, and creating condensation. Weather On The Move is divided into seven weeks. There is a section on scheduling your unit study, the Boy Scout "Weather" Merit Badge information, American Heritage Girl "Young Meteorologist" Badge Information, and a chapter on getting the most out of your Once-a-Week Unit Study. The chapters contain a family read-aloud, family devotions, science/history, science experiments, geography, vocabulary/language, science/research, arts & crafts, and a little math along with field trip ideas. There are also links that will take you to places on the internet. The first page of each chapter lists all the supplies you will need for the week. There are some worksheets that will help you keep track of bibliographies you read, keep track of daily weather conditions, and hurricane tracking chart. Each student should create a 3 ring binder to keep track of their work. They will include their worksheets, copied poems, stories they make up using suggested idioms, and more. I used Weather On The Move with all three of my girls. All three of them put together their own notebook to keep their work. They all enjoyed the study, but they all like different parts. Delaney loves to take pictures, so her favorite assignment was taking pictures. Alaina is my crafty girl, so she liked the arts & crafts sections & they all liked the experiments. My girls love the Stump Your Dad Trivia questions. Sometimes they can stump him and other times they can't. I love how easy it is to use Homeschool Legacy, the reading and supplies lists make preparation so easy. There are some of the suggested reading material that we did not own or that our library did not have, but we didn't have any trouble finding a book on the topic we needed to read about. I read aloud to my family every night before bed, so the Once-a-Week Unit Studies fit very well for our family. The Once-a-Week Unit Studies from Homeschool Legacy are great for any family. No matter if you complete unit studies all the time or if you have never used one before. They are very user friendly & there is enough variety included for every learning style. A few years ago we used Revolutionary Ideas from Homeschool Legacy. My girls loved it & they are really enjoying Weather On The Move. They don't look at these unit studies as school work, they think they are fun & they actually retain more than if they were just reading a text book.